One of the best things about Ruby and Sapphire was "secret bases"—a feature which let players decorate their own special space, ala Animal Crossing. 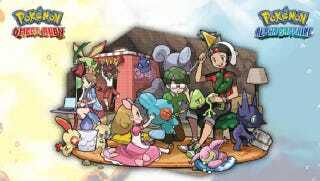 Alas, secret bases aren't in the newer games, X & Y-but they'll be in the upcoming remakes, Omega Ruby and Alpha Sapphire. Super-Secret Bases are an awesome new way to express your creativity and join up with friends in the upcoming Pokémon Omega Ruby and Alpha Sapphire games. Create a Secret Base that's all your own, including selecting and placing Decorations however you like. You can use Decorations to create tricks in your Secret Base, decide the rules for what kind of Pokémon battles are allowed there, and make it like your very own Pokémon Gym! Then get ready for other players to come and challenge you! Using communication features, it's easy to connect with other players around the world to share your Secret Bases with one another. When you visit another player's Secret Base, that base's members will be hanging out there. You can talk to them or even battle them! If you find base owners that you like, you can scout them as one of your Secret Pals and bring them back to your own Secret Base. Once you've become Secret Pals with someone, you can continue to have Pokémon battles against them, and also have your Pal use "special skills" to support you on your adventure. Another fun aspect of Super-Secret Bases is a capture-the-flag activity. Examine the flag beside the Secret PC in another player's Secret Base to obtain it! You can take one flag per day from each base visited. Visit lots of Secret Bases and collect lots of flags to improve your team's rank and get rewards, including increasing the skills of your Secret Pals. Flag colors will change based on a team's rank, so you can tell another team's rank at a glance—and others can tell yours! You can share your Super-Secret Base with Trainers all over the world! Symbolize your Secret Base with a QR Code. With a QR Code, you can get the Secret Base of a particular player you've been wanting to visit.